Shenandoah Valley from Maryland Heights (Alfred R. Waud, 1864, U.S. Library of Congress, public domain). 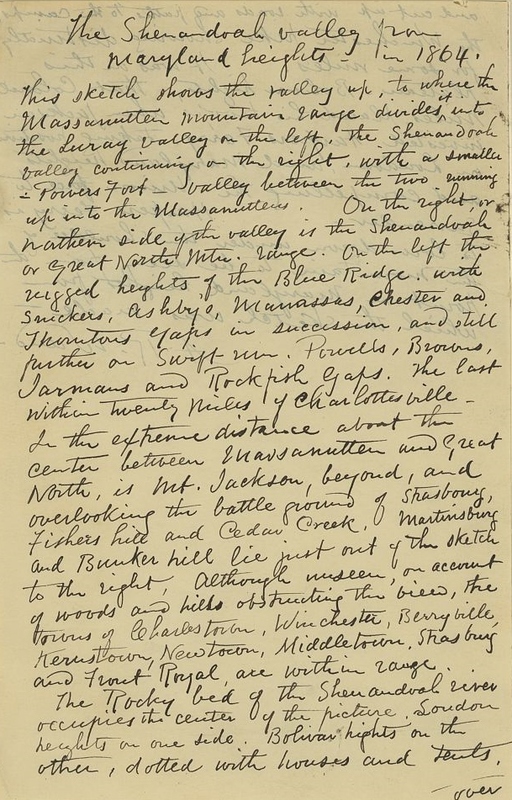 Shenandoah Valley from Maryland Heights (Alfred Waud’s notes, p. 1, U.S. Library of Congress, public domain). The Shenandoah valley from Maryland Heights – in 1864. This sketch shows the valley up to where the Massanutten Mountain range divides it into the Luray valley on the left. The Shenandoah valley continuing on the right, with a smaller – Powers Fort – valley between the two running up into the Massanuttens. On the right, or the northern side of the valley is the Shenandoah or Great North Mtn. range. On the left the rugged heights of the Blue Ridge, with Snickers, Ashby’s, Manassas, Chester, and Thorntons Gaps in succession, and still further on Swift-run, Powells, Browns, Jarmans, and Rockfish Gaps. The last within twenty miles of Charlottesville. In the extreme distance about the center between Massanutten and Great North, is Mt. Jackson, beyond, and overlooking the battle ground of Strasbourg, Fisher’s hill and Cedar Creek. Martinsburg and Bunker Hill lie just out of the sketch to the right. Although unseen, on account of woods and hills obstructing the view, the towns of Charlestown, Winchester, Berryville, Kernstown, Newtown, Middletown, Strasburg, and Front Royal, are within range. Shenandoah Valley from Maryland Heights (Alfred Waud’s notes, p. 2, U.S. Library of Congress, public domain). The Rocky bed of the Shenandoah river occupies the center of the picture. Loudon heights on one side. Bolivar heights on the other, dotted with houses and tents, and cut up with roads and paths to the camps, the Winchester pike showing distinctly for some miles. It was on this plateau – Bolivar heights, that Colonel Miles placed his troops when Jackson invested Harpers Ferry, taking position on Loudoun, and Maryland heights and compelling the Union force to surrender. 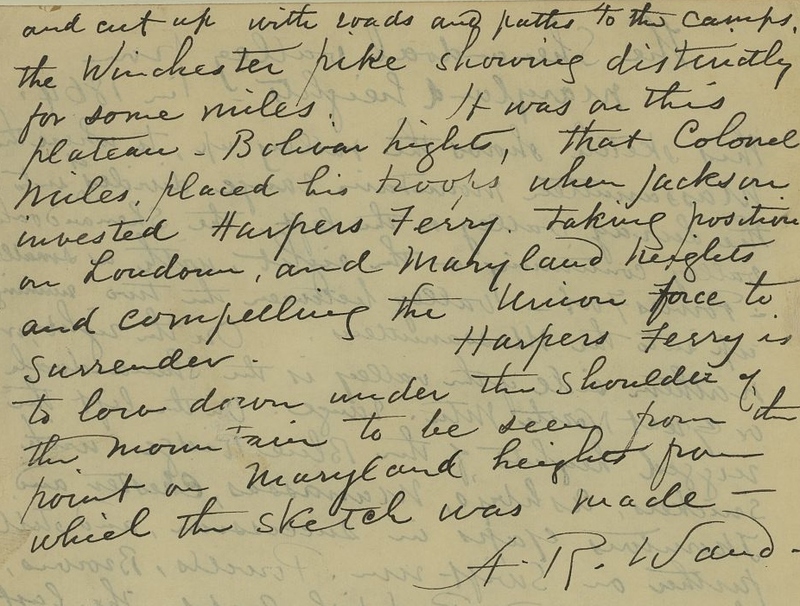 Harpers Ferry is to [sic, “too”] low down under the shoulder of the mountain to be seen from the point on Maryland heights from which the sketch was made. Alfred Waud sitting in the Devil’s Den in July 1863, following the Battle of Gettysburg (Timothy H. O’Sullivan, 1863, public domain). Alfred Rudolph Waud (1827-1891) was a London-born artist who became a notable chronicler of the American Civil War. 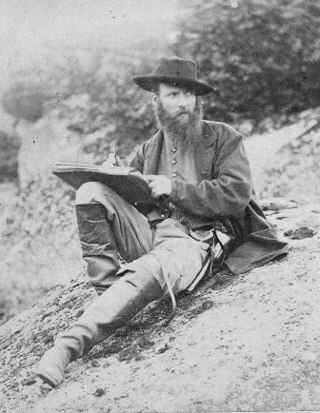 Hired as a full-time staff illustrator for the New York Illustrated News in 1860 and then by Harper’s Weekly in 1861, he reportedly observed every battle fought by the U.S. Army of the Potomac between July 1861 and March 1865, and became one of only two sketch artists to witness and illustrate the strategic maneuvering, valor and carnage which transpired during the Battle of Gettysburg in 1863. His sketches of the 1864 Shenandoah Valley Campaign, which turned the tide of the U.S. Civil War significantly in favor of the Union, preserved for posterity the stark contrasts between the valley’s beauty and the ugliness wrought by war.